Ethylene (C2H4, also known as ethene) is a gaseous organic compound that is the simplest of the alkene chemical structures (alkenes contain a carbon-carbon double bond). Ethylene is the most commercially produced organic compound in the world and is used in many industrial applications. Ethylene is also a gaseous plant hormone. The hormone effects of ethylene on general plant growth were first noted in 1864 when leakage from gas street lighting systems caused stunting and deformation of nearby plants. In 1901 Neljubow identified the active component of the gas to be ethylene but it was not until 1934 that Gane identified that plants could synthesise ethylene and in 1935 Crocker proposed ethylene to be the hormone responsible for fruit ripening and senescence of vegetative tissues. Research has since demonstrated that ethylene has an important role in many plant development processes, including seed germination, vegetative growth, leaf abscission, flowering, senescence and fruit ripening. Ethylene also plays a role in response to water stress, chilling and mechanical injury. Early examples of the human utilization of ethylene to enhance fruit ripening include the ancient Egyptian practice of gashing figs to enhance ripening responses. 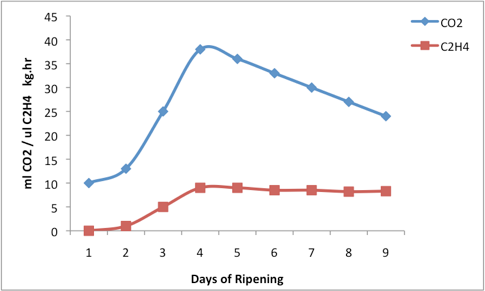 The ethylene produced by the injured fruit tissue triggers a broader ripening response. Similarly, the ancient Chinese practice of burning incense in closed rooms with stored pears (ethylene is released as an incense combustion by-product) stimulates ripening of the fruit. The idiom ‘one bad apple spoils the barrel’ is based upon the effect of one apple ripening (or rotting) and emitting ethylene which accelerates the ripening and senescence of apples stored with it. 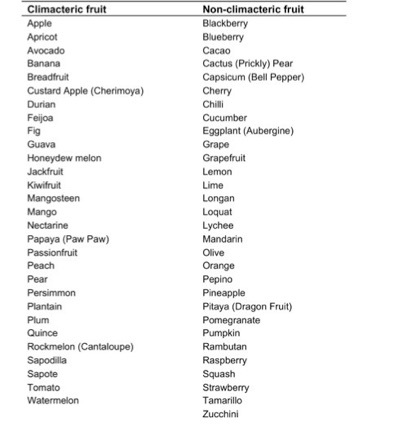 Considerable research has since been conducted into the effects of ethylene on fruit ripening. Strategies to minimize fruit exposure to external sources of ethylene and treatments for managing the internal ethylene concentration are the key to commercial optimization of the storage life and eating quality of many fruits. Understanding the fundamental relationship between ethylene and fruit respiration rates during ripening is necessary in order to manage the harvesting, storage and distribution processes. Ripening is a term applied to fruit that describes the transition from physiological maturity to senescence (ageing and death of the plant tissues). It is a developmental stage evolved to facilitate reproduction by preparing the seed-bearing organ for detachment from the plant. Ripening is the start of significant biochemical and physiological transformations, such as changes in skin colour, internal flesh softening, aroma development and sweetening. Ripening generally begins after fruit has reached maximum size and is physiologically mature. At physiological maturity fruit have accumulated a range of complex molecules in the form of carbohydrates, proteins, lipids and organic acids. Once detached (harvested) from the plant the fruit continues as a living organism but can no longer draw on water and nutrient from the plant to supply its energy needs and complete the ripening processes. The fruit remains metabolically active and respiration now relies on these accumulated complex molecules. Respiration is a process of oxidative breakdown (catabolism) of complex molecules into simpler molecules, yielding energy, water, carbon dioxide and simpler molecules needed for other cellular biochemical reactions required for ripening. The respiration rate per unit of fruit weight is (as a general rule) highest in immature fruit, with the respiration rate declining with age. Thus respiration rate of fruit is an indicator of overall metabolic activity level, progression of ripening and potential storage life of the fruit (i.e. a low respiration rate means that the energy reserves will take longer to be consumed and the fruit can be stored for longer). Some fruits show a significant variation to the pattern of declining respiration rate during their ripening. They exhibit a distinct increase in respiration rates (a respiratory climacteric) of varying intensity and duration, commensurate with ripening. Fruit that exhibit this characteristic increase in respiration rate are classified as ‘climacteric’ whereas fruit that follow the pattern of steadily declining respiration rate through ripening are classified as ‘non-climacteric’. All fruit produce at least small quantities of ethylene during ripening and the internal ethylene concentrations of non-climacteric fruit varies little during their growth and ripening. Exposing non-climacteric fruit to external concentrations of ethylene can transiently increase their respiration rate proportionally to ethylene concentrations. This transient increase in respiration rate may be evoked more than once but ethylene exposure hastens their senescence, shortening their storage life and potentially causing a loss of eating quality. Climacteric fruit produce much larger quantities of ethylene, although the internal ethylene concentrations vary significantly between fruit types. For most climacteric fruit a sharp increase in internal ethylene concentration precedes or is coincident with a dramatic increase in respiration rate. The increasing ethylene concentration triggers the increase in respiration rate (metabolic activity) and attendant biochemical and physiological transformations that occur during ripening. Ethylene production in climacteric fruit is described as an ‘autocatalytic’ process i.e. exposure to an initial small concentration of ethylene causes the fruit to produce greater quantities of ethylene until a peak concentration is achieved. Exposing immature climacteric fruit to ethylene can trigger this autocatalytic response, causing premature ripening and result in fruit with poor eating quality. Climacteric fruits are frequently harvested at a physiological stage that is considered ‘commercial maturity’, typically in a hard green but mature stage just before ripening has initiated. Examples include bananas, mangoes, tomatoes and avocados. This enables the fruit to be harvested, cooled, stored and transported significant distances to where it will be marketed and consumed. Ripening can then be conducted under controlled conditions of temperature, relative humidity and ethylene to achieve uniform appearance and quality of ripe fruit. Fruit is placed into specially constructed ripening rooms and brought to optimum ripening temperature and humidity. Ethylene is then raised to a prescribed concentration using either a “catalytic generator” that makes ethylene gas from liquid ethanol or from commercially available gas supplies. Forced-air cooling systems ensure that fruit are uniformly exposed to the room ethylene concentration. When fruit are exposed to ethylene under these controlled conditions they will initiate their respiratory climacteric pattern and ripen at a relatively uniform rate. Conditions and duration can be varied to suit customer specifications for stage of ripening and colour development. Treatment times vary depending on conditioning and ripening stage required but once fruit has reached the desired pulp temperature a treatment time of 24 hours with a room ethylene concentration of 10 µL/L is sufficient to stimulate coordinated ripening for many climacteric fruits. As fruit respiration rates increase in response to ethylene treatment it is important to ventilate rooms to prevent the build up of carbon dioxide, emitted as a respiration by-product. ‘Ripe ‘n’ Ready’ is a retail strategy used for marketing climacteric fruits to consumers in a ready-to-eat state. Consumers are increasingly purchasing less quantity per shopping event but shopping more often. Traditionally consumers would need to plan ahead when purchasing climacteric fruit in the early stages of ripening and wait for the fruit to ripen before consuming. The Ripe ‘n’ Ready strategy is to pre-condition/ripen climacteric fruit to be able to present consumers with a ready-to-eat product. To achieve this requires a synchronised supply chain that can ensure timely delivery of fruit after the ripening treatment has been applied. Some new varieties of tomatoes are marketed as ‘vine ripened’. These ‘truss tomatoes‘ develop their colour and flavour while still attached to the plant. They have been developed through cross-breeding with non-ripening tomato varieties and are usually grown hydroponically in greenhouses. They develop colour without softening like conventional tomatoes and remain firm for harvest, packing and distribution. These tomato varieties do not exhibit a climacteric like conventional tomato varieties but remain susceptible to external ethylene. 1-Methylcyclopropene (1-MCP) is a gaseous molecule that blocks the sites of ethylene binding and action in fruit. Marketed under the commercial name ‘SmartFreshTM’, it is increasingly used across a wide variety of stored products where the inhibition of ethylene effects is desired. Although results show a significant extension of storage life, display life and delay in softening, there are also reports of poor aroma and flavour development in some fruits as a consequence of 1-MCP’s inhibition of the respiratory climacteric. There are no known toxicological or environmental impacts from its use. Aminoethoxyvinylglycine (AVG) and aminooxyacetic acid (AOA) are compounds that inhibit the synthesis of ethylene within the fruit. Pre-harvest applications of these chemicals enable fruit to reach greater maturity and colour development on the tree prior to harvest. They do this by inhibiting the 1-aminocyclopropane-1-carboxylic acid (ACC) synthase enzyme. ACC synthase is thought to be the rate-limiting step in fruit for the production of internal ethylene – ACC being the precursor molecule to ethylene in the ethylene biosynthesis pathway. Ozone generators when used in coolrooms are also alleged to react with and ‘scrub’ ethylene in the storage atmosphere. While ozone will destroy ethylene on contact, its use in coolrooms carries other risks to worker safety with 0.1 µL/L ozone the limit of exposure.  Understanding the effects of ethylene on fresh produce can be helpful in ripening and storing fresh produce in the home kitchen. Recommendations such as putting a ripening banana in a paper bag with an unripe avocado to speed up ripening of the avocado are based on the concept of the ripening banana emitting ethylene that will trigger the climacteric response in the avocado. Placing the paper bag inside a plastic bag may enhance this practice by containing more of the ethylene gas emitted by the banana. This strategy will work with any combination of climacteric fruit but will work best when the ripening fruit is one that emits a high concentration of ethylene such as apples, pears, bananas, avocados and passionfruit. The practice is similar to the commercial practice of using ethylene for ripening. Ripening for most fruit is best conducted at room temperature, around 20oC. Climacteric fruit should not be cooled below their ideal storage temperature or there is a significant risk that they may not complete their ripening processes – reducing their eating quality. Low temperature can inactivate essential enzymes required for full ripening to occur or cause chilling (low temperature) injury. Refer to the temperature guidelines in the storage temperatures for fresh produce page to check the ideal storage temperature for fresh produce types. 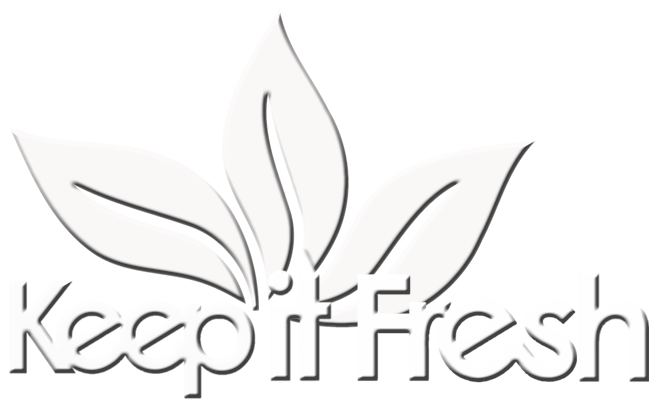 Many non-climacteric fresh produce types also respond to ethylene, increasing their respiration rate and thereby reducing their storage life or quality may be reduced by exposure to ethylene. Where possible, keep ripening climacteric fruit separate from other types of produce to minimise loss of storage life and eating quality. Occasionally new consumer products are launched that claim to remove ethylene from fruit and vegetable storage drawers in home refrigerators. These are often based on some variation in use of potassium permanganate which is a chemical that oxidises ethylene to carbon dioxide and water. These products may absorb ethylene and extend storage life to some degree but the efficient destruction of ethylene requires large contact surface areas. There are a number of other oxidants with higher specificity for ethylene that show potential to be incorporated into future packaging materials as ethylene scavengers. Concerns are periodically raised in mass media about fruit being ‘gassed’, implying that this confers some residual food safety risk from the ethylene gas and that the fruit has been somehow rendered ‘unnatural’. The commercial use of ethylene for fruit ripening is at a low concentration and simply initiates the respiratory climacteric. The ethylene used commercially has the same molecular structure. By the time the ethylene-treated fruit reaches the consumer the climacteric may have started, there is no trace of applied ethylene gas, any ethylene emitted by the fruit is generated by the fruit itself and is of a much greater concentration. There are no food safety issues associated with the consumption of climacteric fruit.